The complete first series of Tweet of the Day, with introductions by David Attenborough, Chris Packham, Kate Humble, and many others. 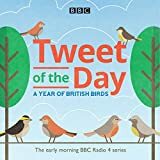 First heard every weekday morning at 5:58 am on BBC Radio 4, Tweet of the Day has become popular with early risers and bird lovers everywhere. In this collection, every edition from the program's first series—British Birds—is collected together. The songs of over 160 British birds can be heard during the course of one year's programs. Among the other presenters of the editions are Michaela Stachan, Martin Hughes-Games, and Bill Oddie. The BBC Natural History Unit (NHU) is a department of the BBC which produces television, radio, and online content with a natural history or wildlife theme. It is best known for its highly regarded nature documentaries, including The Blue Planet and Planet Earth, and has a long association with David Attenborough's authored documentaries, notably Life on Earth.